Virtually anyone who watched the presidential inauguration Monday agreed: singer Beyonce’s performance of the national anthem was chilling. As good as it was, however, it’s now controversial. Multiple reports today suggest that she wasn’t actually singing the national anthem, but lip syncing as the U.S. Marine Band’s music played. “We don’t know why Beyoncé decided to use prerecorded music,” a spokesperson for the Marine Corps Band told us this morning. “All music [for inaugural ceremonies]is prerecorded as a matter of course, and that’s something we’ve done for years and years. The Marine Band did perform live throughout the ceremony but we received last-minute word that Beyoncé wanted to use the recording.” The spokesperson also added that everyone knows Beyoncé is a gifted singer, and her decision has no bearing on her musical ability. In other words, it isn’t unusual for the band to have recorded music ahead of time, as it appears they did here. One of America’s most beloved singers not actually singing as the world watched, however? The humanity! I’ve reached out to the Marine band to make sure their comments are accurate. In any event, it appears the Marines involved did nothing out of the ordinary. The Presidential Inaugural Committee (PIC) requested that the Marine Band accompany Beyonce Knowles-Carter in the performance of the Star-Spangled Banner at the 2013 Inaugural Ceremony. However, there was no opportunity for Ms. Knowles-Carter to rehearse with the Marine Band before the Inauguration so it was determined that a live performance by the band was ill-advised for such a high-profile event. Each piece of music scheduled for performance in the Inauguration is pre-recorded for use in case of freezing temperatures, equipment failure, or extenuating circumstances. Regarding Ms. Knowles-Carter’s vocal performance, no one in the Marine Band is in a position to assess whether it was live or pre-recorded. Sure is different than that first statement, isn’t it? Too Bad! Chicks talented for sure, I think she should have rolled with it. They should have gotten Jennifer Hudson. 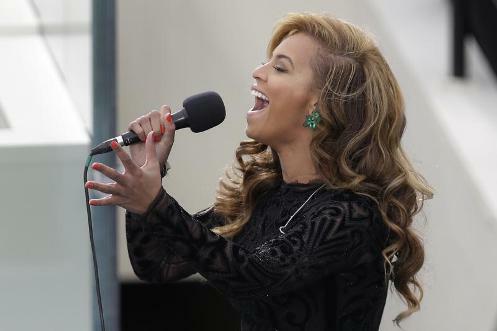 Much better singer than Beyonce, Beyonce is just a performer! Not a good singer or actress. Besides I don’t care for Beyonce ever since 2001 when she (Destiny’s Child) decided to do a performance off base on Okinawa Japan when MWR set everything for an on base performance. Destiny’s Child charged for standing seats off base which was more money then they would have gotten had they performed on base for military members and their family. I have the highest regard for the US Marine Corps Band; every time I have seen them perform, live or on television, I swell with pride for our country. I had been surprised, therefore, when I heard them playing the National Anthem in the background, behind this singer doing her best ‘Vanilla Ice’ imitation. The music I was hearing was totally unlike anything I had ever heard coming from the Marine Corps band. I was unmoved, and I didn’t like it. The United States Marine Corps Band is and always has been the best martial music band in the world. They are the Gold standard for marching bands and martial music. Unfortunately, in this instance, I feel that they allowed themselves to be diminished in the eyes of the world by succumbing to mere political pressure. I hope that the next time I see them perform, I will be able to forget about this aberration, and will hear the real National Anthem of the United States of America. Thank you for this opportunity to express my views. God Bless the US Marine Corps.